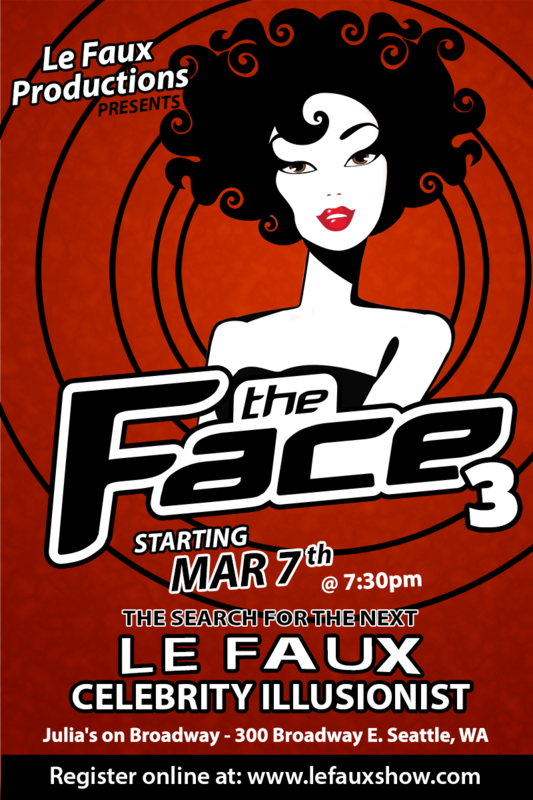 "The Face 3" is a competition where all contestants begin at week one and are eliminated until one finalist is chosen as the winner. This competition is open to both male and female performers of all experience levels. The director and mentors will be creating the winner into a celebrity impersonation primary for Le Faux. This is the primaries for contestants. You will perform your best drag or impersonation. We will select contestants that we feel are best to take on this huge life changing experience. Mentors will select contestants who they feel they can work with. If more than one mentor chooses the same contestant, the contestant will choose the mentor. After a mentor selects contestants, mentors will give guidance on improving your performance and impersonation skills. Mentors will help select the person you can best impersonate. All contestants return to perform with the guidance and direction led by the mentors. This week, mentors will be looking at your resemblance to the character they suggested you impersonate. This round a contestant will be eliminated from the competition. At the end of the show, mentors will give direction on areas to improve so you can return for week 4. They will be looking at your resemblance and mannerisms. Remaining contestants will return to show the progress you have made. This week the mentors will be focusing their judging on your character resemblance and mannerisms. A contestant will be eliminated this week. Mentors will give you direction for next week's competition, where they will be looking at your performance ability. Remaining contestants will return to show the progress they have made. This week the mentors will be focusing their judging on your character resemblance, mannerisms and performance ability. A contestant will be eliminated this week. Mentors will give you direction for next week's competition, where they will be looking at your costume and makeup skills. Remaining contestants will return to show the progress they have made. This week the mentors will be focusing their judging on your character resemblance, mannerisms, performance ability and costume & makeup skills. This final week contestants have an opportunity to bring in a number and look you feel is best for you. We want to see who you think you best impersonate after going through this intense drag boot camp. A contestant will be eliminated this week. Mentors will give you direction for the finials. Remaining contestants will return to show the progress they have made. This week the mentors will be focusing their judging on your character resemblance, mannerisms, performance ability, costume & makeup skills and speaking ability. A winner will be selected this week. 3. No water or fire on stage. 6. Bring your performance music on a fresh CD in MP3 format only or flash drive. No other formats will be accepted. 7. Cannot be under the influence of any substance or will be disqualified. A. Contestants will perform to one musical number. D. Mentors are looking for performances which have a combination of dance, style and lip-synching skill. E. Mentors want to see you have more than one look. It would be advised to come prepared to show your drag versatility. - This competition is open to both male and female performers of all experience levels. The Director and mentors will be creating the winner into a celebrity impersonation primary for Le Faux. Depending on your impersonation and performance ability, this can turn into a one year contract as a regular primary in Le Faux. - After a winner is selected, Le Faux will be investing in your character illusion personality, costumes and production. These can only be used at Le Faux performances. No exceptions. Registration starts on February 7th and ends March 13th. Show starts at 7:30pm. Be there and ready to go by 7pm. YES, I have read the rules and performance tips and I agree to the terms. I am able to perform to completion.